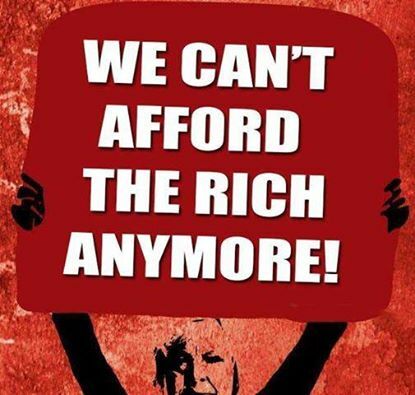 A Radical Alternative To Austerity! 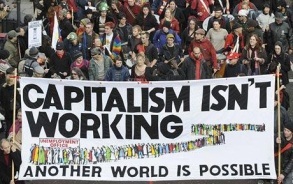 In Britain and internationally, people are demanding a radical alternative to austerity. People have suffered as Tory austerity took the UK economy to the brink of a triple dip and have seen the same happen when austerity has been tried in Europe and elsewhere. Even now, only the better-off are feeling the benefit of any growth. Yet the UK remains the 7th richest country in the world – there is no lack of wealth in the UK. The problem is that this wealth and other resources are held in the hands of too few people – and austerity policies have only made this worse. 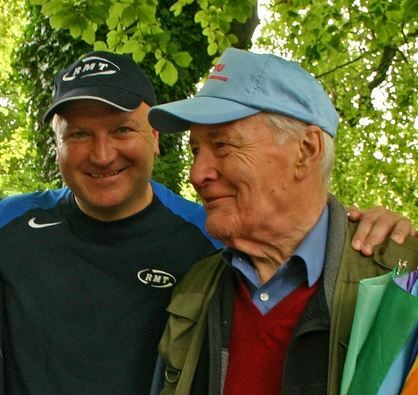 We need social and economic justice which, traditionally, Labour always stood for. We must demand that the Labour leadership stop shilly-shallying and wholly rejects austerity. 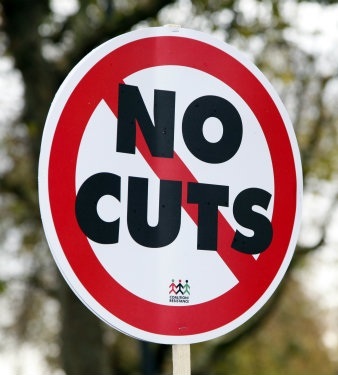 Austerity is a Tory political doctrine which is wrecking public services, has removed safety nets for people in trouble, punishes the poor, and is busy privatising our NHS, schools and as many public services as the Coalition can push through before 2015. It failed in the 1930s – the “hungry 30s” and, again today, the Coalition’s austerity policies are driving more and more people to desperation and reliance on foodbanks. Meanwhile the Coalition continues to defend fat cat bonuses for city executives and banksters, and is still cutting tax for the rich and big business. 49 weeks before the general election, come along to discuss how we can ensure Labour makes a clean break and adopts a radical alternative to austerity. To win the election outright Labour must offer hope to millions of people who have given-up on politicians and stopped voting. To do this Labour must commit to full employment, to create real jobs for all, rebuild our communities, restore the NHS and the welfare state, and save our schools. Offering mealy-mouthed statements on managed, softer cuts is a betrayal of Labour’s historic mission to represent the working class and improve the lot of the majority of the population. This message must be conveyed loud and clear to Labour’s leaders. 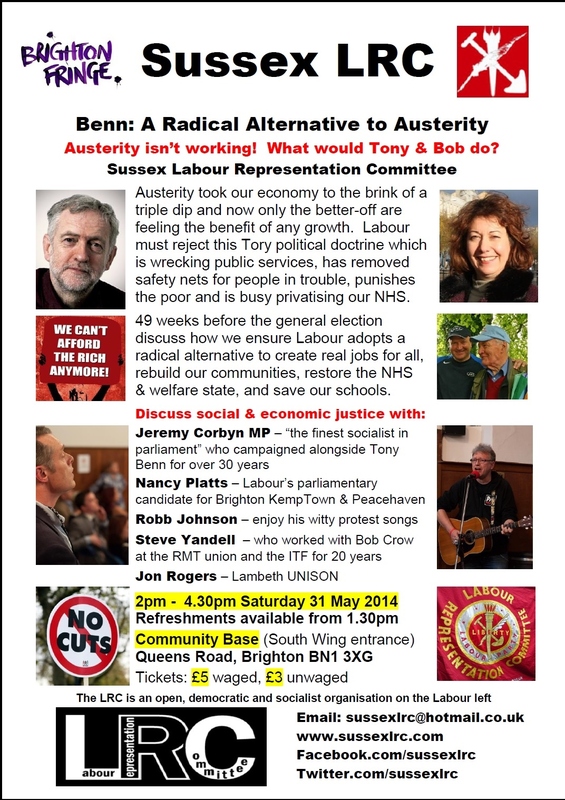 Discuss social and economic justice with “the finest socialist in parliament” Labour MP Jeremy Corbyn, who campaigned alongside Tony Benn for over 30 years, Labour’s parliamentary candidate for Brighton Kemptown and Peacehaven – Nancy Platts, Sussex’s favourite protest singer/songwriter Robb Johnson, Steve Yandell who worked with Bob at RMT and the International Transport Workers Federation for 20 years, and Jon Rogers of Lambeth UNISON. 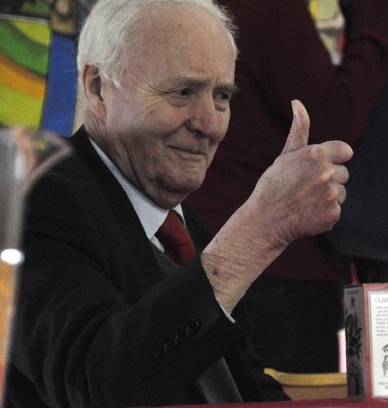 Enjoy a live performance of some of Robb’s witty protest songs, including the brilliant tribute Bob Crow Was A Union Man and celebrate the commitment of socialist legends Tony Benn and Bob Crow. Tickets are available at just £5 (waged) or £3 (concessions) from us or via the Brighton Fringe Box Office online or on 01273 917272. We hope to see you on Saturday 31 May 2014. What follows the failed policies of austerity? What we demand!